John McClane has been one of my favorite cinematic characters over the years. 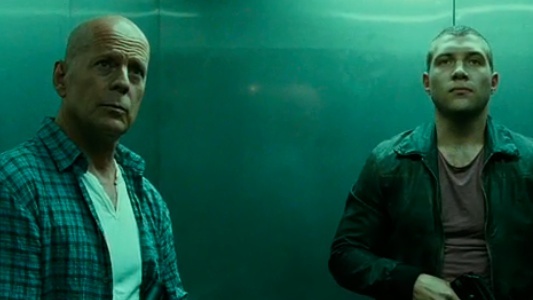 The star of the Die Hard franchise, played by the aging Bruce Willis returns to headline the 5th movie of the series in A Good Day to Die Hard. In the follow-up to the mildly disappointing and extremely unrealistic (standing on the wing of a jet anyone?) Life Free or Die Hard, the setting of the film has shifted overseas to Russia as McClane flies over to try to help out his son Jack (played by Jai Courtney) who is in a bit of political and legal trouble. Jack is a CIA agent who is trying to infiltrate a Russian crime ring and early on you can tell he wants no help from his father (whom he calls John instead of Dad). Jack and John eventually work things out and team up together, battling with a rather forgettable group of villains. This movie is a mixed bag. There are some amazing action sequences (including some excellently choreographed car chases) and enough familiar Die Hard moments to keep this movie in line with its predecessors However, the plot is not that remarkable and there are some cringe-worthy moments that don't fit in, especially a scene in which Willis inexplicably decides to talk on the phone to his daughter during an intense car chase. The ringer on his cell phone plays the Beethoven's Fifth notes from the original Die Hard's theme. Super cheesy. Willis easily slides right into his comfortable role as McClane. There are times when it seems as if he'd grown tired of the franchise and there are a few one liners that seem a bit forced. Courtney really saves the movie though as his brash portrayal of the younger McClane is spot-on and becomes the perfect compliment to the gusto of Willis' performance. Courtney (an Australian actor) is a relative newcomer to big budget films but I can see a little Tom Hardy in his toughness. I would recommend this movie to anyone who is a fan of the Die Hard franchise. This film earns 3 JRs for a mildly entertaining extension of the McClane legacy. I've heard that apparently this film is not the end of the road for the McClane character. I would welcome another FINAL chapter involving John and Jack. To end the series, it might be a good idea to set it another skyscraper as a parallel to the first movie.